I love questions from my readers! I like to problem solve. Let’s be honest I love problems. Sorting things out makes me tick. Joyce asked how to ease in a sleeve, so I wrote to her directly. Karine asked for a view of President Omaba’s beige suit. Another reader requested advice on a reversible dress. I am so flattered that people think I have something to offer. Of course I am not an expert really but I will have a go, and make suggestions if I can. But last week I got an enquiry last week that I am not sure how to answer, so I will share it with you. I request you blog about superb easy patterns for beginners. I’ve loved the Vogue wrap dress and have made three. I’m looking for patterns that are easy but with style and that wow factor. I have written back and asked Rachel what sort of style she likes beyond the DVF-type jersey wrap dress. When suggesting patterns as well as the level of skill required (beginner) we really need to know something about the wardrobe personality, and if you have a straight or shaped body outline. I haven’t heard from Rachel, but let’s assume she has a classic wardrobe personality and a shaped body. This I surmise from her enthusiasm for the wrap dress (but I could be wrong – “wow” may mean she is a dramatic!). Now I need to state that I am not very au fait with the wide range of commercial patterns available, as I tend to use second-hand, vintage ones, or I make or adapt my own. The main reason for this is that I am fairly stingy (new patterns can cost £6-£15), and I don’t think the date matters too much if you are just looking for the basic shapes. The classic shapes don’t change very much over the years. However there are many great bloggers out there who follow the most up to date trends, are much more prolific than I am, use contemporary commercial patterns, so they have a lot more experience than me. I am thinking especially of Ruth and Fairy who are both encyclopedic in their knowledge of what is available, what is nice to make and might suit a beginner. Ooobop regularly reviews what Burda has available. My friend Lyn is fairly new to sewing too and she may comment on patterns she has tried. Maybe other readers could make suggestions for Rachel. So, as someone who doesn’t always answer the exam question, I will provide you with my suggestion for a beginner who wants to sew a few great items. 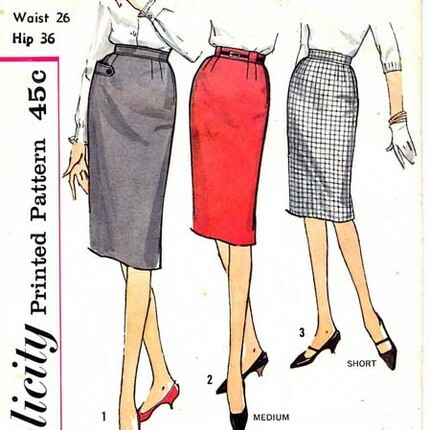 I would start off with a fitted skirt – either a pencil or a flared skirt, with a proper waist band and zip. I would make a few versions until I got a good fit. I would play around with the pattern – trying different fabrics and lengths, different depth of waist band, perhaps include patch pockets or trimming, then with a lining. I would keep going until I was happy with how the skirt fitted, and I had a great looking skirt. You can get an old pattern on eBay for a pound or two, or you could draft one to fit you (it is not difficult). Then I would work on a sheath dress, or perhaps a princess line dress, in the same way. I would be focusing on fit and technique. You can see how most patterns offer a few variations, so you could do both these dresses and then include your own variation – maybe a V neck or a more revealing back. Shorter? Full length (with splits), shorter as a tunic top to wear over trousers? I haven’t yet talked about style or wow factor, but for me the wow comes from getting a good fit and using a really attractive fabric. 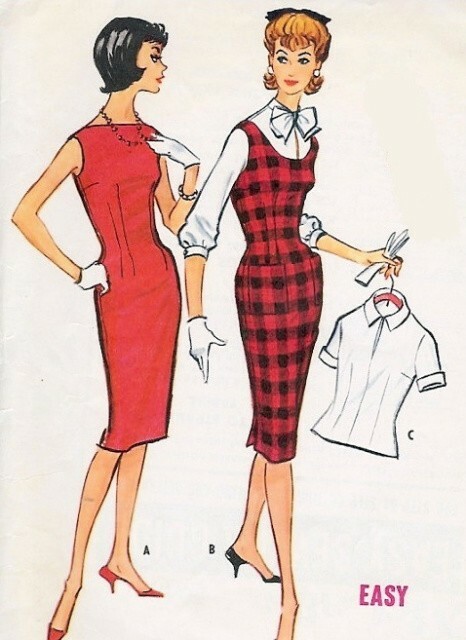 I know that some of the designers have created wow outfits with amazing asymmetrical features, pleats, ruffles, patchwork combinations, volumious pockets, arty belts, and unusual silhouttes, but as a Classic dresser (with a little twist) I am less attracted to details, and more interested in line, structure and an elegant (figure flattering) look. I do like interesting pattern cutting and would happily wear Vivienne Westwood. While I like the classic shapes I am not particularly conservative. 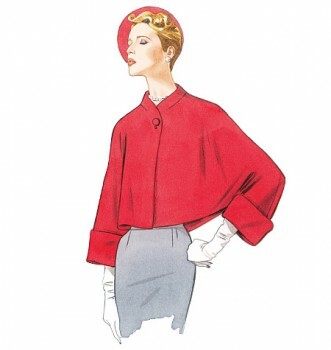 Next I would move on to a blouse or perhaps a shirt-dress – something with button holes. They are not terribly challenging with a modern sewing machine, but need to be conquered. The collar and cuffs are also challenging but keep going. WIth this pattern you get a nice flared skirt too! Then I would make a jacket. By now you may be regarded as an experienced beginner or intermediate seamstress. It doesn’t have to have a collar to start with. I am sure others will have more sensible suggestions in response to your query. I appreciate the question and welcome any topics for blogs or questions about style, colour, design or construction. I will do my best to help. Lots of love from Aunty Fabrickated. Rachel is a friend (and client) of mine! I suggested she look at your blog as she had admired my wrap dresses and I told her that you were my inspiration for making them! You are right to guess that she has a dramatic personality and bright cool colouring. I haven’t analysed her body line and style but I would imagine semi-straight. She has curves but not such a defined waist to be shaped. A sheath dress would work well or even an empire line maxi dress for the summer. I’m just about to have a go at self drafting one for Grace and I as a beach dress for holidays. I love strapless dresses when out and about in the sun so I don’t have a mix of strap lines! With my brother’s wedding coming up I need to make sure I am strap-line free for the dress I am planning to wear! Brilliant, and yes I am classic, dramatic. I sent an email back that day I wonder where it went. Please let me know your email address again and I’ll resend, pesky mail! Papercut Patterns are perfect for beginner sewers. The instructions are great, the sizing very true and easy to adjust and the styles are modern, easy to construct and help sewers to master new skills like welt pockets. I’d also recommend Craftsy.com courses – mastery of technique offers a wider choice of patterns. 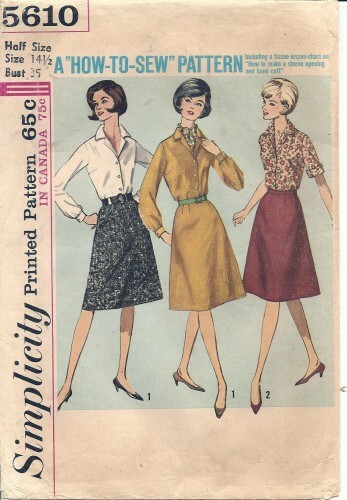 This is so good, K. And so tantalizing, with your lovely vintage patterns. I can’t wait to get back to sewing and I think the trajectory is going to be the same for me as for your reader. Perfecting basic shapes is anything but boring. I completely agree that there is a huge “wow” factor in a skirt with a perfect fit and finish or a dreamy sheath dress. Instead of whipping on to the next flashy thing, I know I would benefit from refining my fit. Using an amazing fabric is what then makes the garment shine. Prima magazine offers a free, easy pattern every month (you have to order it though). I was given a bunch of these by a friend who reads Prima and I’ve made one ‘wow’ dress from them, the other I gave away. Often they can be too basic but as with all ‘easy’ patterns, by finding simple online tutorials you may get suggestions on how to add individual touches to upgrade them. Then you can claim you kind of designed the garment yourself. I’m thinking basics here – like a foundation wardrobe. Straight fitted skirt – perfect to wear anywhere and fairly simple to put together – check. Pick your fabric and it will take you from the boardroom to the beach. Shirt with collar – white, of course, but the collar might take a few attempts to get “just’ right and then it’s all worth it. Trousers – get it over with early in your sewing career – fix your crotch depth and you will never regret the effort! Dress – choose a style – waisted, empire or shift , whatever is best for your body shape and stick with it. Do not think because you can sew that all of a sudden you will now look good in drop waisted frocks! I speak from experience. As for patterns, I am a big fan of Vogue and the single reason is because they fit right out of the envelope for me (mostly). For someone starting out – go to StyleArc. Fab designs and the instructions are so crap that you’ll have to figure it out yourself that you’ll learn so much just by trying. Ha ha ha – thanks so much Ruth for your kind feedback. Learning from crap instructions! Have you ever tried to explain a technique to someone without actually showing them? In words? It’s really challenging! I love following instructions, and figuring what they meant from a tiny drawing that was obviously composed about 60 years ago (with the vintage patterns), and then getting a great sense of satisfaction if it actually works out. Your response is helpful to me too. I like classic with a twist but am fairly conservative. Your progression of techniques is interesting; I’ve had a tendency to jump all over the place. My husband has been saying make several of one thing to perfect it. He’s right, as you are, I know. After these next two I have already semi-started, I will make my approach much more systematic! I was unable to book tickets for Savage Beauty – my daughter suggested this might be the case but I found it hard to believe! The best I can do is go at opening to get one of the tickets released on the day. Do you think the exhibition is worth this or would you recommend something else more? This daughter is getting married and we may look at some fabrics. Hi Anne – yes I think it is worth turning up on the day to go to this exhibition, but I could take you as my guest if you like. Just let me know when you might be able to come. Really like this post a lot! You’ve summarised what’s been floating around haphazardly in my head for some time 🙂 I have been avoiding wearing anything fitted for years. Think elastic waists. But I’m ready to give semi fitted a go, so I’m going to try skirts with waistbands and zippers, maybe a semi fitted sheath (need to think through about my thick waist), failing which a chic shift might be better and a sleeveless shirt for my warm weather. And yes, a loose cut raglan linen jacket for indoor airconditioning. Oh my goodness, we all struggle starting out, don’t we. My first project is a sewing machine cover. What could be more simple? But I’ve looked at patterns, and I’m embarrassed to say they can be confusing. I found a very simple pattern (almost a box) and one with pockets and doo-dads that I am trying to use to base my own pattern on. We shall see. I am hesitant to make that first cut into the fabrics, yet I’m anxious to be sewing! I have found your posts to be very inspiring and full of great tips.